"The Economic Community of Central African States is an Economic Community of the African Union for promotion of regional economic co-operation in Central Africa." Its flag is a plain white flag with the CEEAC-ECCAS logo, a map of Africa with the member countries colored, and around it the flags of the member states. 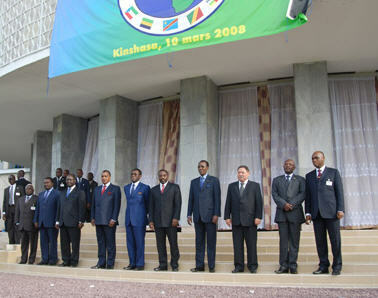 Looking at the flags on the perimeter, it appears this organization includes Angola, Burundi, Cameroon, Central African Republic, Congo Brazzaville, DR Congo, Gabon, Equatorial Guinea, Rwanda, Sao Tome e Principe, and Chad. ECCAS logo is slightly modified, because Rwanda has not been a member. The flag is the logo in the middle of a horizontal blue fading into green flag as seen here.